Elderly people are being neglected and poorly treated by England's health system, inspectors say. The joint report by three public sector watchdogs said the NHS and care services treated older people with a lack of dignity and respect. The Audit Commission, Healthcare Commission and Commission for Social Care Inspection said it was being made worse by a lack of consultation. Campaigners said elderly people had become second-class citizens. The report, which assesses the government's progress half-way through its 10-year plan to improve services for the over 50s, found while some services had improved, progress had been patchy and slow in other areas. David Behan, chief inspector of the Commission for Social Care Inspection, said: "The evidence from this study is that older people are not involved in the design of services and, consequently, services are not tailored to their needs and aspirations. "It is vital to understand and respond to the specific needs of older people." And Anna Walker, chief executive of the Healthcare Commission, said: "Older people are the biggest users of healthcare, occupying almost two thirds of our hospital beds, yet they continue to be a low priority in both the planning and development of our health service." The elder generation deserve all the dignity and respect that is rightfully due to them. None of the 10 communities across England, whose public services were scrutinised, had reached all the government-set milestones to enable them to meet the standards in the national service framework. Two areas of concern were the planning of public transport and the low priority given to foot care services. One of the worst areas, the report found, was mental health care, where older people found services deteriorating as they passed the age of 65. The vast majority of older people surveyed said they had not been asked their views on the NHS or council services in the last year, and 80% did not think they had influenced the planning of services. The report did find that steps had been taken to address age discrimination in public services and more people were being supported to allow them to live at home. 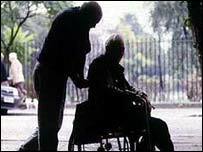 Gordon Lishman, director-general of Age Concern England, said it was "shocking" that so many social services departments were still failing to meet the needs of older people - the main users of these services. He said: "Sadly, too many older people in need of public services are currently treated as second-class citizens." Liberal Democrat health spokesman Steve Webb said: "The needs of older people are not a priority for this government." Andrew Lansley, the shadow health secretary, said the report highlighted the possibility that government targets for assessing patients in Accident and Emergency departments had led to the rushed discharge of older people. He also highlighted concerns about inconsistencies in community rehabilitation of stroke patients. But Care Services Minister Liam Byrne insisted that older people's access to care had been "completely transformed" although neglect was still "too big a part of the story". He said plans would be unveiled next month to improve the situation. And Professor Ian Philp, national director for older people's health, added measures had also been taken to tackle discrimination, but there was more work to do to reverse the lack of respect shown to the elderly.